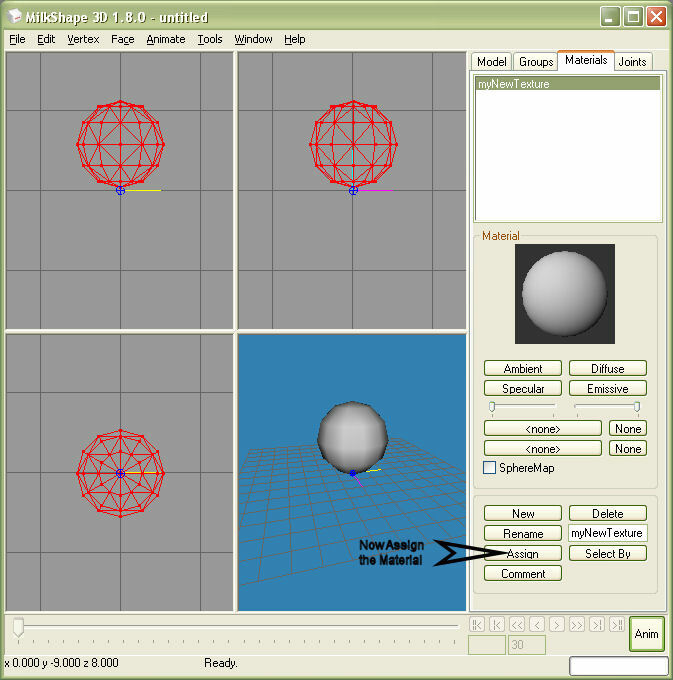 This is a step by step tutorial about building a simple sphere and popping it into the game. 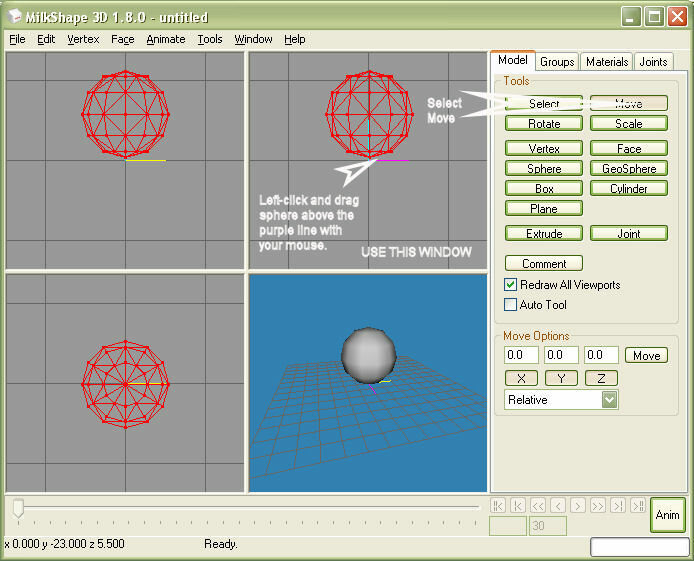 This tutorial will use both Milkshape 3d and NOT Editor tools so be sure to download both before reading on. This tutorial is under the assumption that you have read BOTH How to Make a Sword in Redemption and Creating a Battle-Hardened Milkmaid in Redemption tutorials. 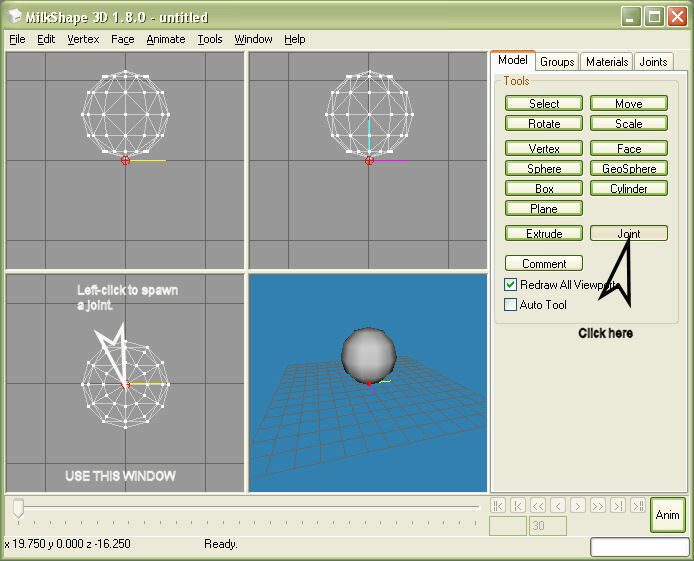 -Now select the Sphere button shown in the image. 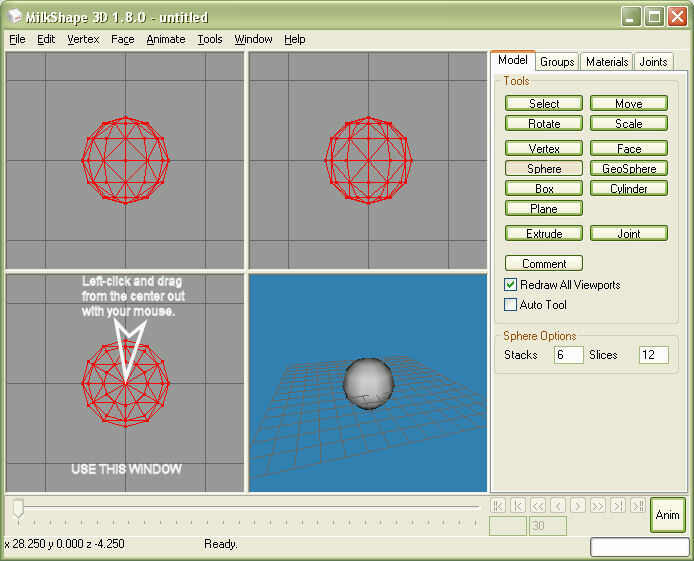 -In the lower left hand build window, we're going to left-click and drag with our mouse to build the sphere on the Z (Top) axis. -Move the sphere so it's above ground. -Create a joint. All meshes in Redemption need a joint. -Deselect everything by going into Edit then choose Select None. 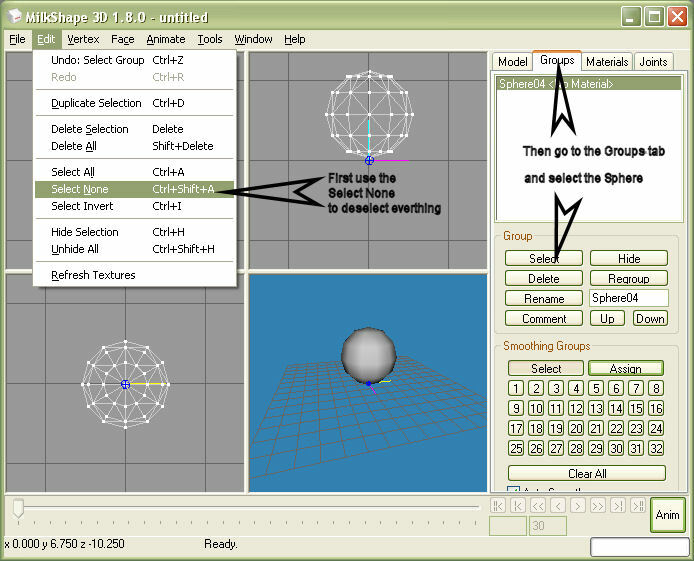 -Go to the Groups tab and select the Sphere again. 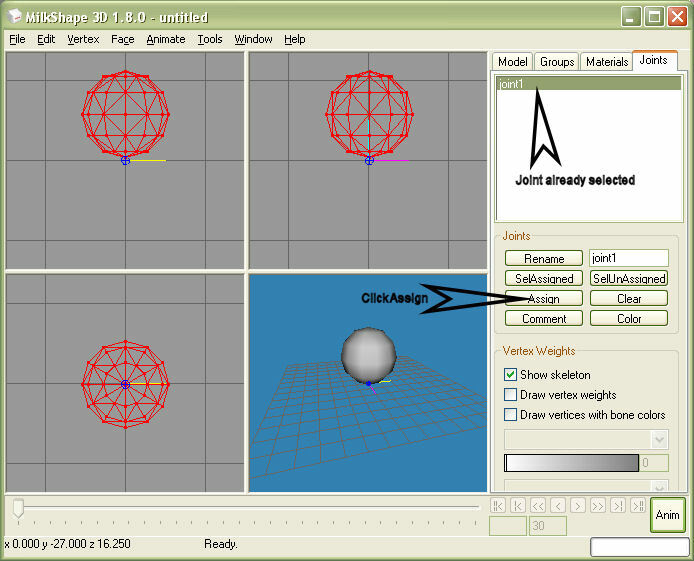 -Go to the Joints tab while the Sphere is selected and press the Assign button for Joint1. -Now let's add a material by going to the Materials tab. 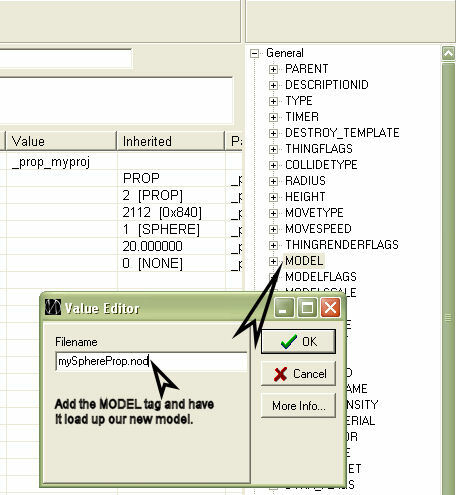 -Press the New button and rename the Material as shown below. 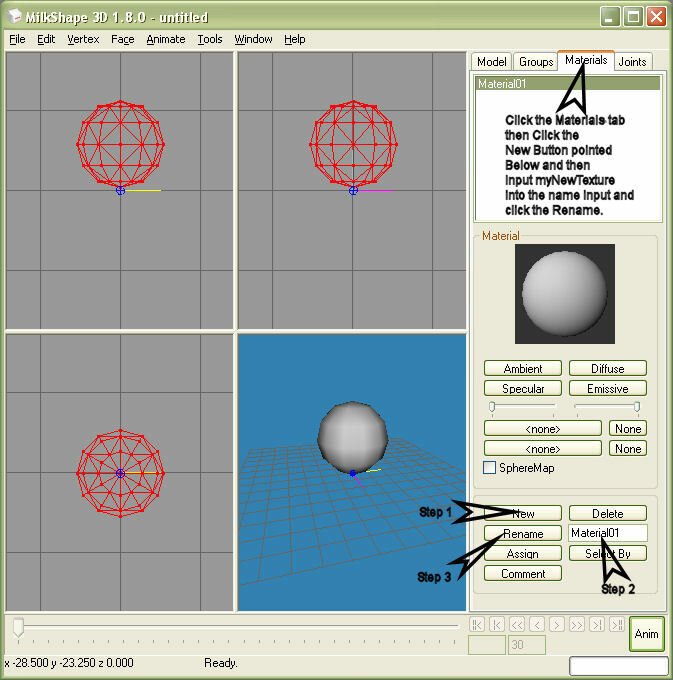 -Then click the Assign button while the Sphere is selected and the new Material will be assigned to our sphere. -You can verify that the Material is assigned by going to the Groups tab and looking at our Sphere group on the list. 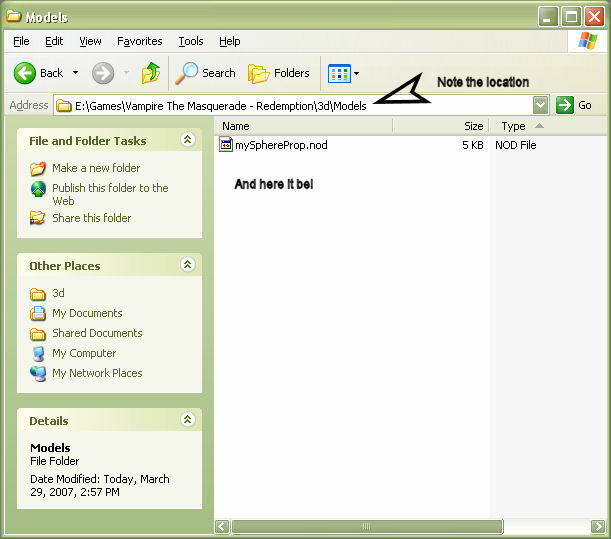 -Go to File menu and Choose export on the list. -Choose the Vampire the Masquerade - Redemption NOD from the exporter list. -If you don't have a 3d\Models folder then create it. 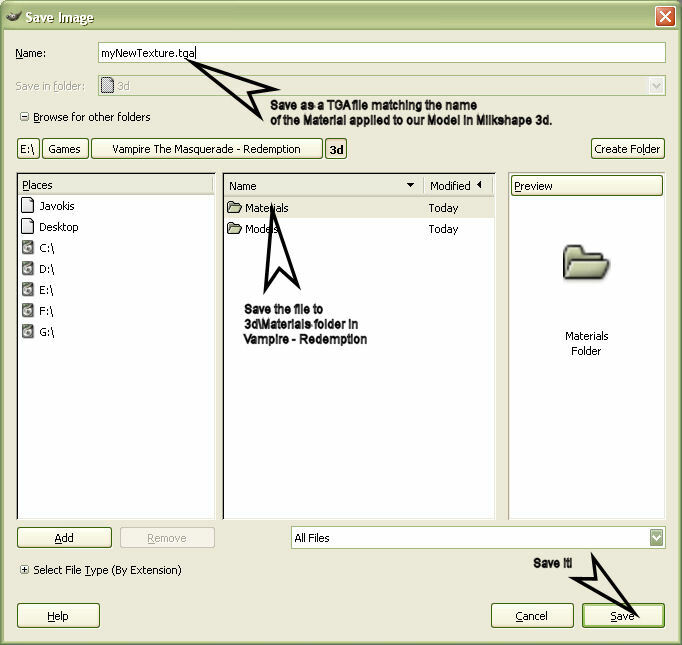 -Now name your file and click Save. -Then click the OK button. -When a message pops up telling you that file doesn't exist then asks whether you want to cancel, click NO. -NOTE: You're only allowed to do this if you are only making a prop with a single joint like we just did. 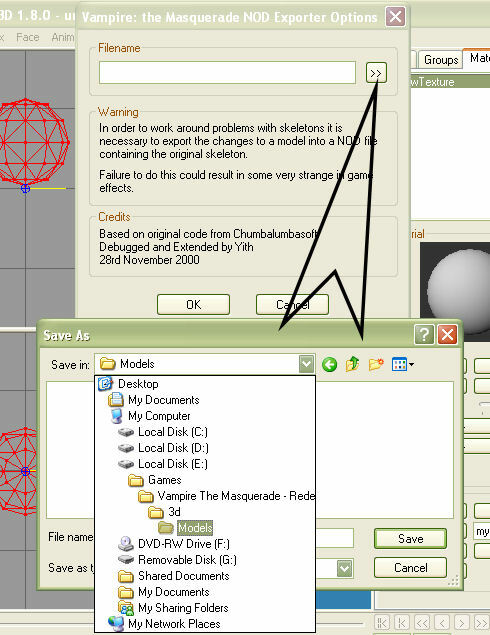 Otherwise, you have to save over an existing nod file that has the same joints as the model you made. -Go into your Vampire - Redemption\3d\Models folder and check to make sure our new model (.nod) file is there. 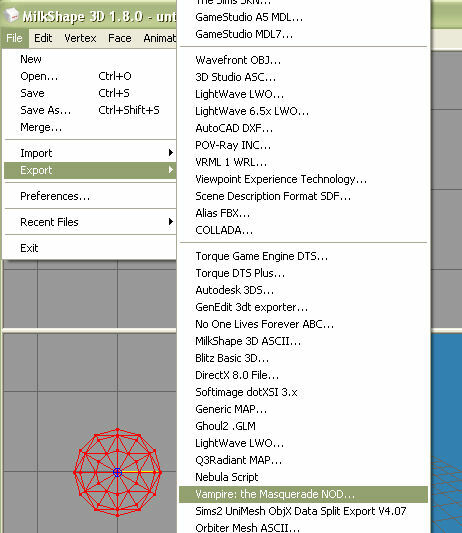 -Now we need to make a TGA file that matches our material name of our model. 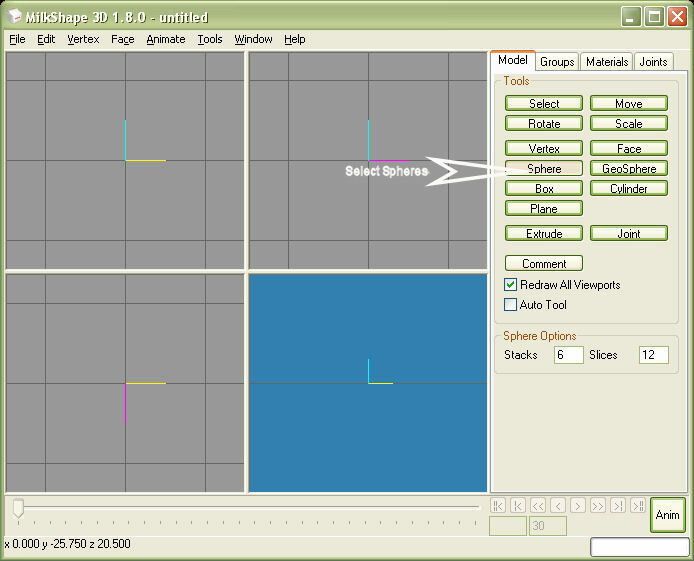 -If you need help in making TGA files then check the Texturing Redemption Using The GIMP tutorial. -As shown in the Texturing the tutorial we need to save our file, but it has to match the name of the material we assigned to our model. 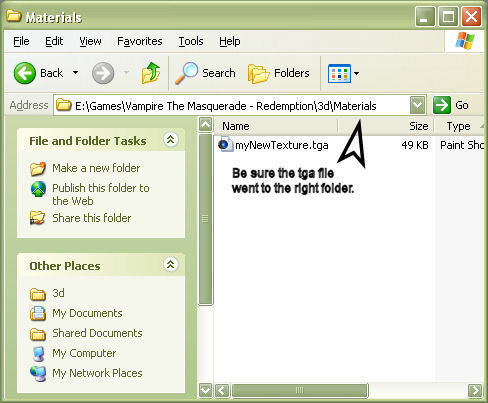 -Be sure to save the TGA file to the Vampire - Redemption\3d\Materials folder. -As in the Texturing tutorial be absolutely sure you UNCHECK the RLE Compression then click OK.
-Now check your Vampire - Redemption\3d\Materials folder to be sure our TGA went inside ok.
-It's time to start using the NOT Editor if we want our new model to show in the game. 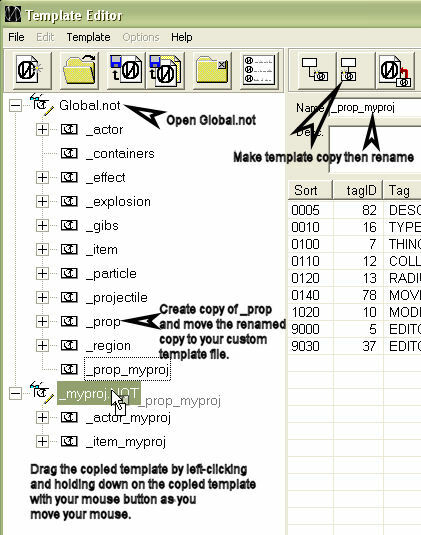 -Open the Global.not file then open your custom template file you created the prior tutorials on NOT Editing. 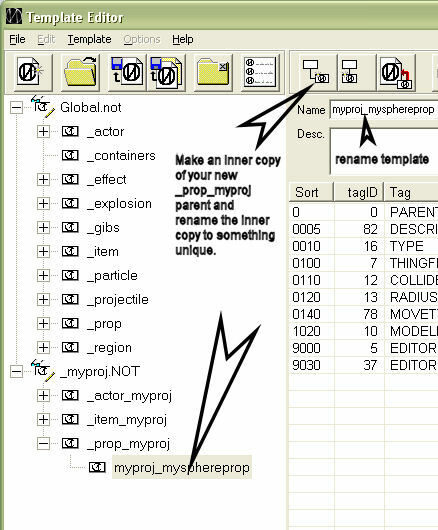 -Now make a copy of Global's _prop parent template, rename it, and drag it to your custom template file. 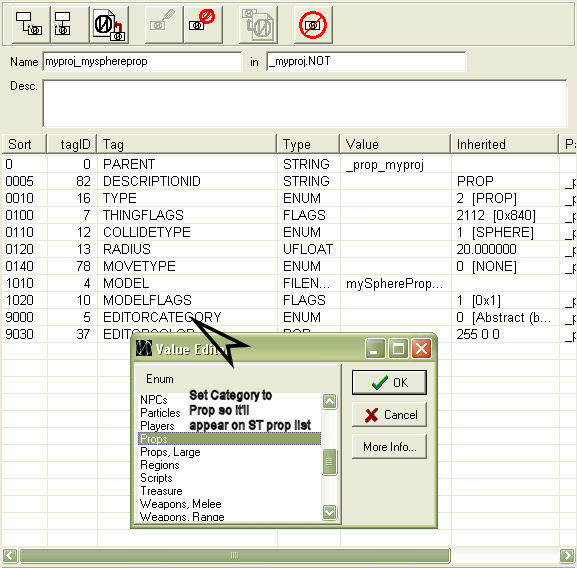 -Make an inner copy (child) of your new _prop_myproj parent and name it something. -Props are pretty simple things. We don't need to do much. -Just add the MODEL tag and give it the name of our custom model. -All we have left is to edit the EDITORCATEGORY tag and we're ready to save it and load the game. -In multiplayer, use the ST mode to spawn the item. In singleplayer, use console addthing [templatename] command. Hello, im trying to make custom prop item in vampire, i have correct model and texture, but have problem with making props in not editor, I do exactly what is shown in tutorial, but vampire doesnt recognize my prop item. I try also to modify global.not ,if i do and i add some prop item to this file, game recognize this item and thow it in game menu. So, my problem is imho that vampire doesnt recognize my teplate, which name starts with "_". Then place the nob into your vampire directory. I have some problems with weapons model, i have models of weapons. If i use old tags values as "axe", it works.. Its only thing of NOD editor, or i must do more changes elsewhere, or some changes directly in models? When you make a weapon in NOT editor, you have two required model tags. The first is MODEL and that only reflects what the weapon looks like on the ground. The second tag is WEAPON_MODEL and that one is more tricky. weapon_0.nod - For when christof type models equip the weapon. weapon_1.nod - For when erik/pink type models equip the weapon. weapon_3.nod - For most female models that equip the weapon. weapon_4.nod - For when samuel/nosferatu type models equip the weapon. 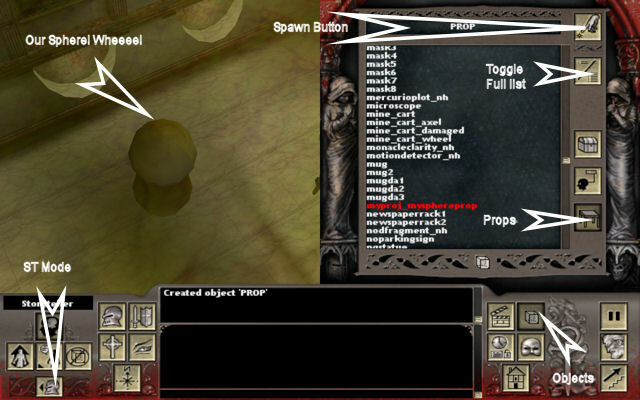 -grab an existing weapon like axe_0.nod, copy it, rename it to yourweapon_0.nod, remove read-only if it is on. -check what bone the axe is attached to, then assign the weapon to the correct bone. -Delete the axe afterward leaving only your weapon behind. Double check that it is assigned to a bone. You'll need to repeat the process for _1.nod, _3.nod, and _4.nod to make the weapon appear for all 4 main model types. Thank you, now it works.. I didnt know, so must add skeleton to weapons model file, and join skeleton and weapon. I have a problem with Milkshape. I wanted to check a skin I made with Milkshape, but the Model is black all over the 3D Window. When I try to load the textures for the model I get the message in the message box, that there is an error loading the textures ( could not open file  ) and an error downloading the materials. I checked the help menu of milkshape for the error 1290 but it was not very helpful. Does anyone know that error and can give me a solution? if someone can help me, I use Milkshape 1.8.2a, however I can not in any way change the model princerudolf.nod of VTMR, claiming incompatibility with the vertices of the skeleton, I tried everything, is there a way, by the type head of another character in the body of princerudolf? PrinceRudolf uses a different skeleton structure than the 4 standard structures used as players in the game. Therefore, you'll need to rig his mesh to a proper skeleton before exporting to that skeleton. Also make sure that all meshes are assigned to a bone. Sorry I get so without introducing myself, I am "Thiago", so researching the structure of the amateur VTMR to 5 years, and this forum is contributing exponentially to my understanding of the game as extruded. I'm making a pack of NPCs dark ages, titled (tc) which I use for my own satisfaction aspects of the 3d SIX Cl0wn that so enriched the great models of the game. Also use some powers of the E-mod 1.8, and think how amazing effects created by Javokis you! Well, in short, follow the evolution of the mods, without the pretense of plagiarizing the work of anyone, or do not intend to expose this material that I'm compiling, ok? Within this small project there is a Ventrue lord, and wish he were sitting in a relaxed manner as the prince Rudolf, however, this character was originally created with the skeleton 0, ie the Christof, and when I try to attach this model to the skeleton the princerudolf.nod he accuses error saying that the skeleton is incompatible with the structure of the new character, you know? Is there any way to make this composition without this error? already provided apologize for my bad English, and I am very grateful for the attention Javokis. -Take princeRudolf.nod and rename it to your desired model - remove read-only. -Import your desired new model's mesh - be sure only princeRudolf's skeleton is the only skeleton in the work space. If your new model has an imported skeleton, remove it. -Export the new model to a model with the same skeleton - in this case, it's the prince's nod file; Your renamed .nod file that was once princeRudolf. The short, somewhat hack-ish answer is that you would have to create a Crinos model in Milkshape that wears the belt, then you would have to create a shapeshift discipline that transforms the user into that particular werewolf model. Check out the tutorials on creating disciplines with Eclipse, and take inspiration from some of the shapeshifting disciplines in Emod and SIXmod. Thanks man, I've got some ideas for doing this!